The Excel addin MTools is the essential software, that significantly enhances the capabilities of Excel. It provides the users with a broad and carefully selected collection of time-saving tools. Even Excel novices will make spreadsheets significantly faster and more reliable than many excel experts. Use MTools and impress your boss with the speed and the reliability of your work or enjoy your free time by finishing your job faster than expected. 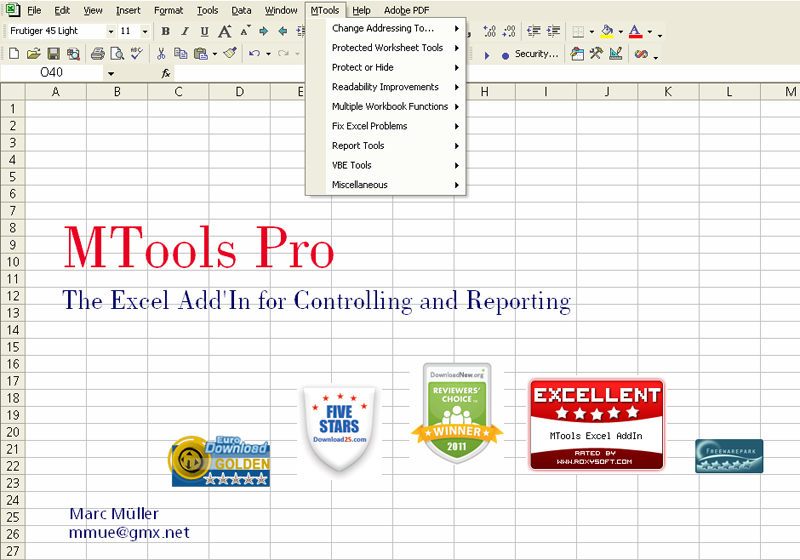 MTools is an easy to use addin, that greatly enhances the capabilities of Excel. ...... your job faster than expected (by your boss). You can trust me! I know what I'm talking about. I work in a Controlling department of an international company and my job is to develop all kind of excel reports and I don't know anybody around me who can do it faster or more reliable than me. You will notice, that I do not offer tools for 'everything', because I know that too many functions confuse the users more than they could help. Therefore I concentrate on those tools, that - by my experience - offer the highest benefit. I invite you to download a free, timely unlimited & unrestricted trial edition. Excel Toolbar or Excel Add-in, designed to ease your work while using Excel. Free Suduko Solver Excel Add-In to help you solving Suduko squares. Qweas is providing links to MTools Pro Excel Add-In 1.046 as a courtesy, and makes no representations regarding MTools Pro Excel Add-In or any other applications or any information related thereto. Any questions, complaints or claims regarding this application MTools Pro Excel Add-In 1.046 must be directed to the appropriate software vendor. You may click the publisher link of MTools Pro Excel Add-In on the top of this page to get more details about the vendor.